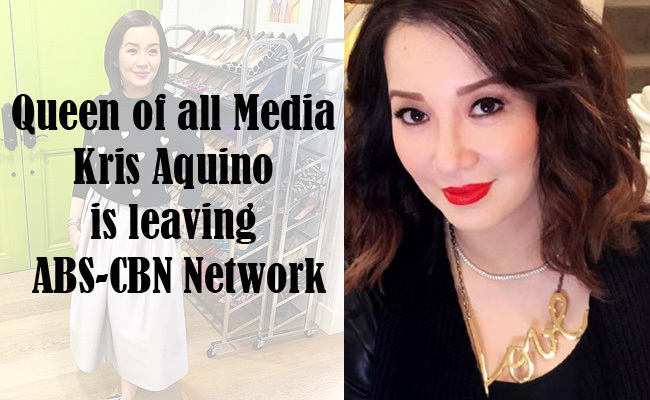 Because of her health condition, the Queen of All Media Kris Aquino announced on March 08 (Tuesday) that she will temporarily leave ABS-CBN to focus more on her children and to take care of herself. In a series of Instagram posts, Kris started with thanking her mother studio ABS-CBN for almost 20 years of being together that started way back 1996. In a separate update, she said that she does not want to constantly worry her siblings and sons because of always being ill therefore she will seek a healthier lifestyle, "eat healthy, sleep early and exercise regularly". She also shared their [she and her two kids] plans to travel and to move to their new house. She also thanked her endorsements and divulged her next projects away from the limelight which includes an expansion of her Chowking and Mang Inasal franchises. Her next franchise is the Jollibee branch in Tarlac which she said could be possible this year. She also met and had a talk with Potato Corner President Joe Magsaysay regarding the expansion of their business venture Potato Corner+Nacho Bimby. Of the several posts, she shared her current health condition. According to her post on Sunday, her high blood pressure elevated on Saturday because of 3-4 days of heavy workload despite of her maintainance medication which only normalized because of having complete bed rest the day before. She even consulted with her 'team of doctors' for her long term wellness which we can assume suggested her indefinite leave. It seemed to be Kris has also been working on the last few episodes of her morning show Kris TV. Kris was also aware that she might be replaced soon and be long forgotten because of this choice of hers. As per her IG post, the Queen of Talk will have her time off starting March 23 without any confirmation when exactly she will be returning.